Believe it or not, the average stress level of Americans has dropped since 2007, according to the American Psychological Association (APA). But, we here at Howard Hanna Insurance Services understand if you don’t exactly feel that way. 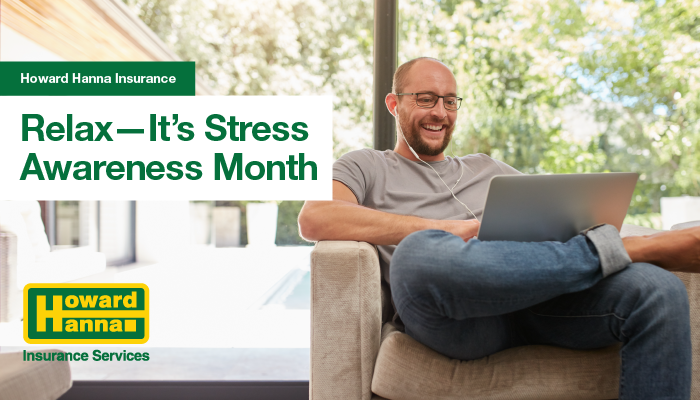 It’s a good thing, then, that Stress Awareness Month is here. 1. Make stress management a goal. Simply saying, “I want to reduce stress” isn’t enough. You’ve got to learn to identify problems and implement solutions, which takes work. 2. Identify your triggers. What situations cause you to experience stress? Work? Relationships? Money? Don’t overlook everyday tasks, such as commuting, or even positive events, such as starting a new job. 3. Consider strategies to deal with those specific triggers. For example, creating a budget plan or talking to a financial adviser could help ease your worries about finances. Changing your hours at work could potentially improve your commute. 5. Ask for help. Many people you know have probably experienced similar stresses to your own. Find out how they have solved problems and relieved stress. And, if they are still having trouble, you can work on managing issues together. It’s a great time to try to reduce stress and live a healthier life. So, what are you waiting for? Remember, when you make stress management a bigger part of your life, you leave less room for the stress itself. Howard Hanna Insurance Services is dedicated to providing you with the best insurance coverage and pricing for everything from your home, to your auto, to your business and much more. Howard Hanna clients are paired with a professional insurance agent who will design a customized insurance plan to suit your needs.